May 12, 2015 Nefer Khepri, Ph. D.
Dolphin Divination Cards by Nancy Clemens. Blue Dolphin Publishing, 1993 $13.00. The Dolphin Divination Cards (C) Nancy Clemens & Blue Dolphin Publishing, Inc. 1993. For those of you who love the novelty of round decks, this is not only round. It’s also small & cute measuring a mere 2″ across. It’s great to tuck in your purse to allow for readings to be done anywhere & under any circumstances. I first ran across The Dolphin Divination Cards in 1996 when I was the assistant manager at a new age store. The owner had an open deck on the counter next to the register and would allow customers to pull 3 cards. For those of you who own your own shop, we sold a lot of these decks due to giving customers the opportunity to interact with the cards before making their purchase. The list goes on. In fact, this tiny deck has 102 cards. The Dolphin Divination Cards are housed in a 2 x 2 x 1 1/2″ box. The box contains a single fold-out sheet of paper containing a brief introduction on how to use the cards, two 3-card spreads (Body/Mind/Spirit and Past/Present/Future), a 5-card spread, and a 4-card Medicine Wheel spread. You do not have to worry about memorizing meanings. There is now a guidebook for The Dolphin Divination Cards available that discusses each card in more detail. If you’re a stickler for card interpretations then you’d probably also want the book, but personally I do not find it necessary. What I love most about these cards is that anyone can use them. You don’t have to be a Tarot expert. I have seen many people walk in right off the street from all walks of life. They pull 3 – 5 cards and have always been entertained and sometimes even guided and comforted by the experience. Dolphins are also non-threatening. Who doesn’t love dolphins? Children can use these cards and religious people who may view tarot cards as “evil” or threatening in some way would also enjoy them. 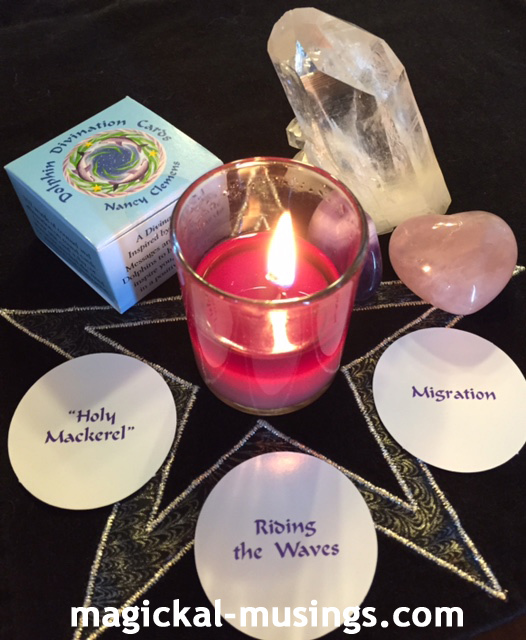 The Dolphin Divination Cards are ideal for daily readings and for readings on the fly. You don’t have to sit and concentrate over them or consult a hefty book. Just read the message the dolphins have given you, draw your own conclusions, and you’re all set. There are some big surprises in store, perhaps some stress with “Holy Mackerel,” but it’s brief. It results in your “riding the waves” by deciding to go with the flow instead of fighting the current. The waves then take you on over to “Migration,” which indicates movement to another place or perhaps movement toward a new realization of some sort. Either way, positive motion forward is indicated by the order in which these three cards appear. My 16 year old daughter loves these cards and has been using them since she could read. Her friends have loved using them so I cannot stress enough this would make a great gift for any child. It’s a valuable tool that over time will teach them to rely on their own intuition when interpreting the messages the Dolphin Divination Cards provide to them and over the years this will help to hone their intuition into a strong and valuable tool. I have enjoyed the Dolphin Divination Cards very much over the years, and I know anyone interested in divination of any kind would also enjoy them. They can be ordered via Amazon.